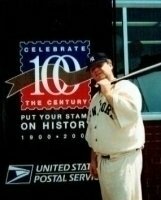 He has traveled the nation and has been hired as Babe Ruth Celebrity Look Alike, Lookalike Impersonator at almost every major league and minor league ballpark in the nation. George Herman “Babe” Ruth, Jr. (February 6, 1895 – August 16, 1948) was an American baseball player who spent 22 seasons in Major League Baseball (MLB), from 1914 through 1935. Nicknamed “The Bambino” and “The Sultan of Swat”, he began his MLB career as a stellar left-handed pitcher for the Boston Red Sox, but achieved his greatest fame as a slugging outfielder for the New York Yankees. Ruth established many MLB batting (and some pitching) records, including career home runs (714), runs batted in (RBIs) , bases on balls (2,062), slugging percentage (.690), and on-base plus slugging the latter two still stand today. 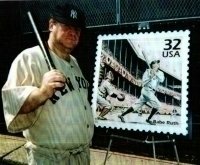 Ruth is regarded as one of the greatest sports heroes in American culture and is considered by many to be the greatest baseball player of all time. He was one of the first five inductees into the National Baseball Hall of Fame in 1936. On April 19, 1949, the Yankees unveiled a granite monument in Ruth’s honor in center field of Yankee Stadium. The monument was located in the field of play next to a flagpole and similar tributes to Huggins and Gehrig until the stadium was remodeled from 1974–1975, which resulted in the outfield fences moving inward and enclosing the monuments from the playing field. This area was known thereafter as Monument Park. Yankee Stadium, “the House that Ruth Built”, was replaced after the 2008 season with a new Yankee Stadium across the street from the old one; Monument Park was subsequently moved to the new venue behind the center field fence. 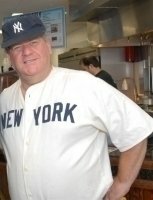 Ruth’s uniform number 3 has been retired by the Yankees, and he is one of five Yankees players or managers to have a granite monument within the stadium. The Babe Ruth Birthplace Museum is located at 216 Emory Street, a Baltimore row house where Ruth was born, and three blocks west of Oriole Park at Camden Yards, where the AL’s Baltimore Orioles play. The property was restored and opened to the public in 1973 by the non-profit Babe Ruth Birthplace Foundation, Inc. Ruth’s widow, Claire, his two daughters, Dorothy and Julia, and his sister, Mamie, helped select and install exhibits for the museum.